As the days get longer and the weather gets warmer, the annual Spring Bird Census – the largest volunteer-supported ecological survey in the Park – begins once again. Now in its 10th year, the census provides a wealth of long-term information on avian abundance, distribution and habitat use across the Park. The census is carried out by volunteers of Cumberland Bird Observers Club, who last year recorded 122 species from a total count of 25,104 birds. Many special birds, including uncommon or threatened species, have already been recorded within the first 3 weeks of the 8-week census. Collection of such a vast amount of data, essential for informed management, would not be possible without the dedicated volunteers who return year after year. Sydney Olympic Park Authority is grateful for the participation of all census volunteers. Photo: Birdlife Australia. 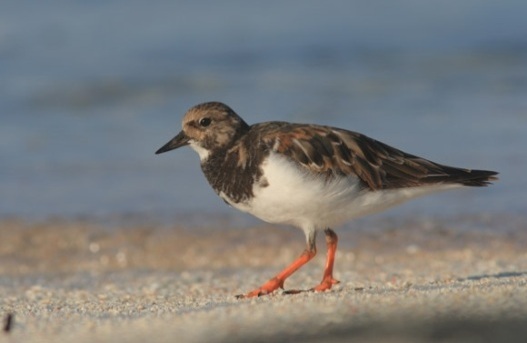 Ruddy Turnstone, a migratory wader that breeds in Europe, Asia and North America, has never before been recorded in the Park.